Here is a selection of my Shamanic Mirrors. I thought it may be useful to see the diversity of origin, size and design. As an indicator of scale, the shiny mirror at the right end of the 2nd row is 4 inches/10cms across. There is plenty of information on the web about these mirrors and their use if you Google ‘Shamanic Mirror’ or ‘Toli’ or ‘Melong’, so I won’t repeat all that guidance. There are also plenty for sale, but it is almost impossible to know what you are buying, so please be careful and don’t spend a fortune just because someone on Ebay spins a good yarn. None of mine are for sale, so I’ve no axe to grind, but there are sellers out there who deserve to reap the bad karma they are sowing by ripping people off with fakes, stolen goods or goods from grave robbings. These are ‘Melongs’, Tibetan in style, most with the distinctive 3 dot pattern. The first is a little melong of the ‘Chinese Zodiac’ type, empowered by the shaman and given to those who need curing or blessing for travel etc. 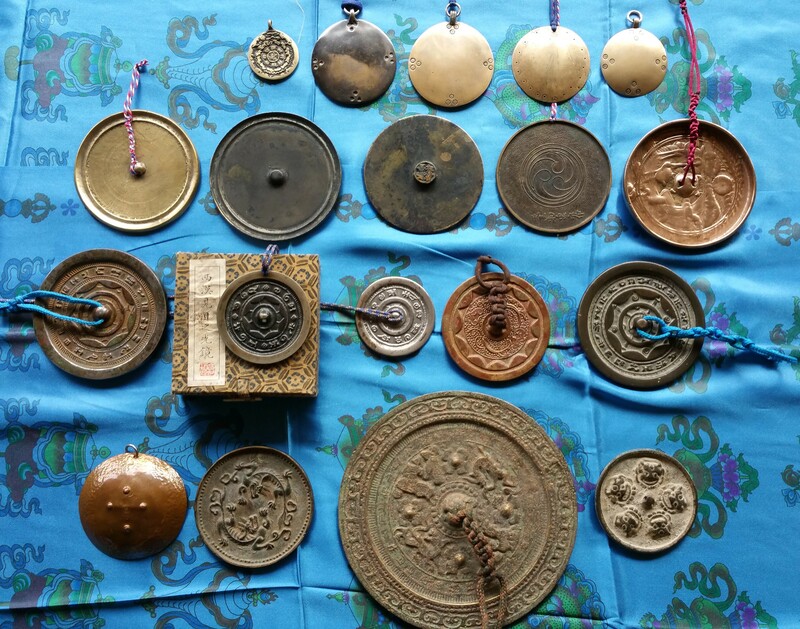 The rest are of a type carried and used by the Tibetan Shamans and also by Lamas. The middle three are old, the outer two are fairly recent. These would all be classed as ‘Tolis’. The first is probably not incredibly old but would have been made with very basic methods, possibly in a village in Mongolia. The second and third are a few hundred years old and of a type commonly worn by shamans. The 4th has a gakyil or ‘joy swirl’ at its centre and is Japanese, as is the 5th mirror, which is a Shinto shrine mirror seen as a ‘home’ of the ‘Kami’ spirits. These are all Tolis and are Chinese in origin of ‘Han Dynasty’ style, often with a story in characters around them. Can you spot the ‘fakes’? Well, there isn’t really any deception going on. The first is a genuine Han mirror. The second is a modern reproduction made for people to buy after, say, visiting a museum with an original on view. The third is again a genuine Han mirror. The fourth is coated in cinnabar and is also genuine and rare. The fifth is a more modern copy, which is to say it may still be quite old, and is not made to deceive buyers, but as a replica, a tribute, but not of the same quality. An oddball mix! The first one is something I made as a kid, knowing nothing about melongs, but it seems I was drawn to something I hadn’t yet found when bashing the copper with dots in 4 directions. The second and fourth are what I call ‘dry reproductions’ of Chinese mirrors which may be sold as ‘shamanic’. A genuinely old bronze piece is often smooth and almost leathery in feel. These are dry and rough and, for once, are intended to deceive, knocked up in a Chinese factory and churned out for Ebay. Just to confuse – the largest looks similar but has genuinely been in the ground a long time, encrusted, and was covered in rust when found. Rust on an old piece of bronze shows it has been in soil, from which the iron is deposited…………….so make sure you aren’t buying something robbed from a grave. So, that is a selection of shamanic mirrors, and some very amateur description which I’ll follow with some very amateur advice. Make your mind up about your own motivation and needs. Are you a collector of fine art and shiny things, an antiques snob, or someone who want a tool to help work with the spirits? You can be all three, of course, but if your main interest is shamanic then ask your spirits for guidance, ask your teacher, or buy from a reliable source. By ‘reliable’, I mean someone who will have handled the melong/toli and have a feel for its suitability for shamanic use.